A talk with Reem Mobassaleh, founder of R.Y.M Jewelry : Engineered yet spiritual is that really jewelry? R.Y.M Jewelry debuted in 2016 with two defining collections : the Diamond Digit collection and the Purely Portemanteau. However, Reem Mobassaleh now based in Dubai but a globetrotter who was born in London and raised in the U.S. started making jewelry since 2009 but truly developped a concept 2 years back. Olivier Dupon is the author of The New Artisans (2011), The New Jewelers (2012), The New Pâtissiers (2013), Floral Contemporary (2014) and Encore! The New Artisans (2015), all published by Thames & Hudson. Awaiting the publication of his new book on luxury jewelry that will be published later this year. 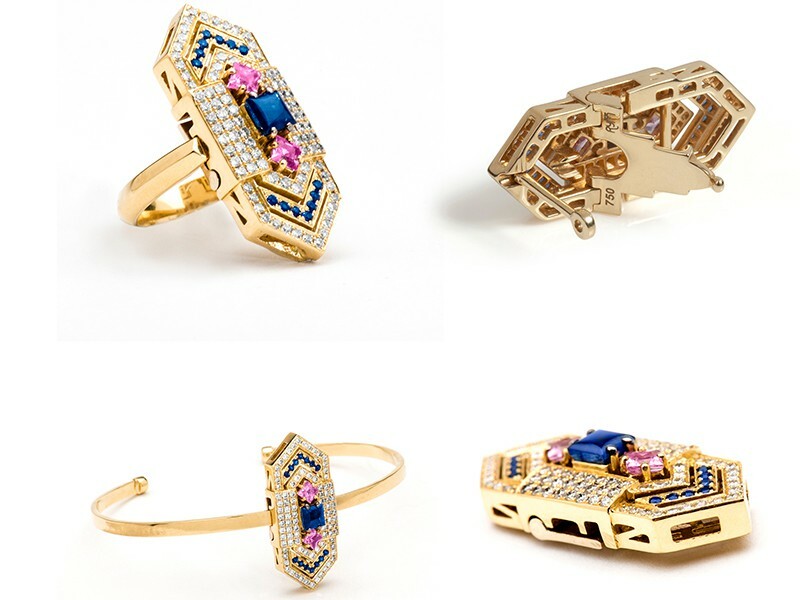 As a freelance reporter for The Eye of Jewelry, Dupon managed to interview Reem Mobassaleh founder of the brand R.Y.M. If we say, engineered yet spiritual: can’t be jewelry? Well… think again. 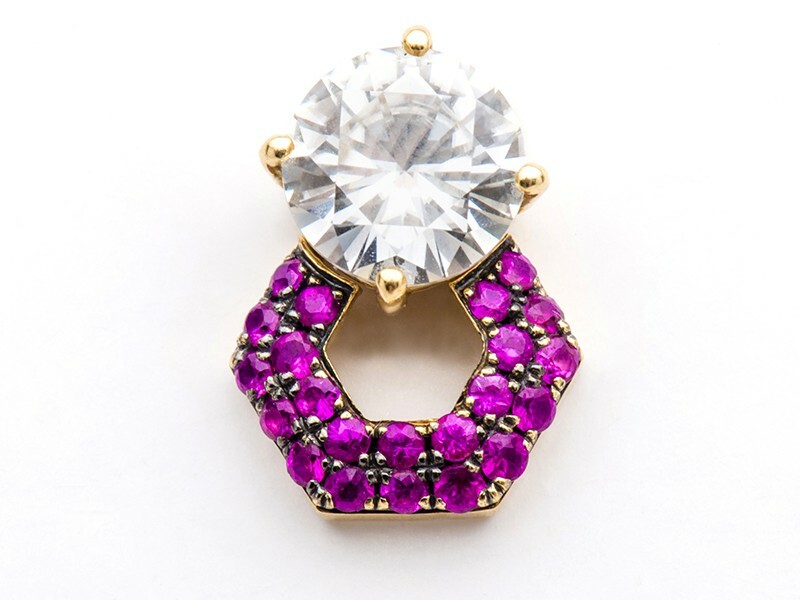 What if it took a modern woman to design a modern woman’s jewelry? Notwithstanding the narrow scope of this statement, it just makes sense when you look at it through the prism of resourcefulness. Reem Mobassaleh, founder of R.Y.M. Jewelry, says she designed out of her need for versatility since, being a globetrotter, she found herself always on the go between cultures and continents. At some point, she envisaged personal pieces of luxury that could fit a variety of circumstances in a compactly adaptable collection. Unsurprisingly and a clue to the ingenuity of her creations, she looks up to Leonardo da Vinci, the ultimate Renaissance man, for “his passion to design, to understand the underlying structure in systems; biological, mechanical, structural, and natural”, she says. Born in London, raised in the USA and United Arab Emirates, and spending her summers in Europe, Reem’s first venture into design was in interiors and handbags. Prior to this, Reem studied for her BA at the prestigious Brown University in Rhode Island before completing her MBA at New York’s Columbia Business School. Now based in Dubai, Reem applies herself fully to the jewelry craft she has honed since 2009, after an innovative concept led her to change career paths a few years down the line. “I’ve been designing jewelry for about eight years and focused on the brand for the past two”, she explains. 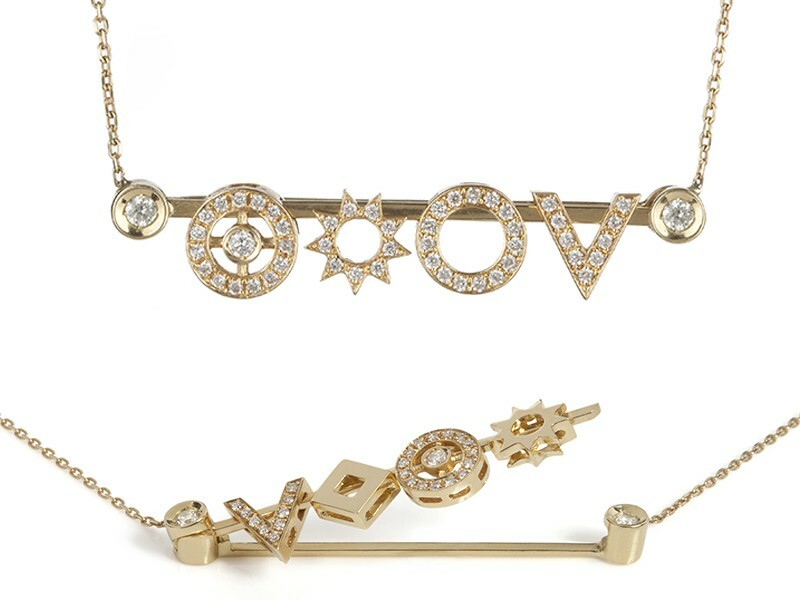 R.Y.M Jewelry debuted in the second quarter of 2016, with two defining collections: the Diamond Digit collection, a graphic reinterpretation of the digits 0-9, ‘hereby establishing a new language of numbers inspired by geometry’; and the Purely Portmanteau collection, a modular system which aims for ‘extreme focus on versatility’. Let’s learn more about R.Y.M. 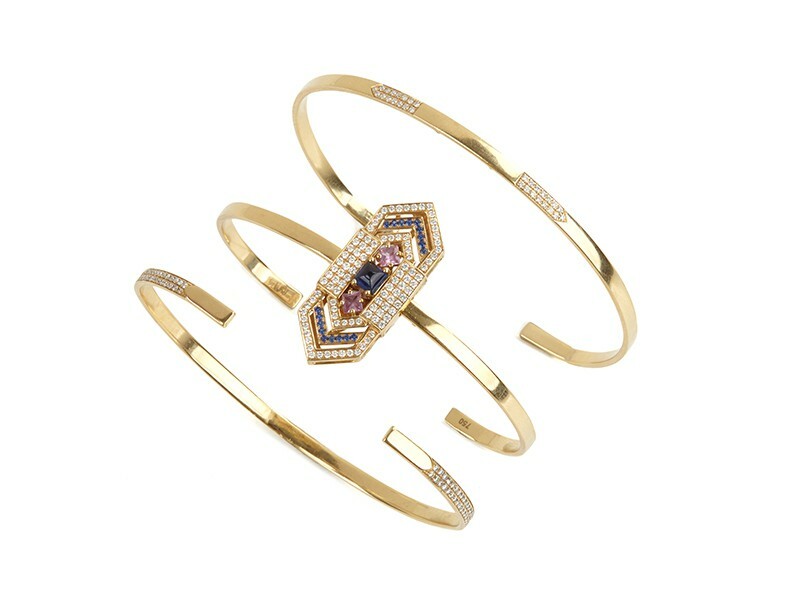 Jewelry from the modern woman behind it all. Olivier Dupon – When did you know that this what you wanted to do ? Reem Mobassaleh – I had to take a few months away from the my main job for foot surgery, which gave me the space and lots of undivided attention to think through how to scale what had been an original passion project. I started to think seriously beyond the aesthetic and my own personal relationship with jewelry and its design. I started to dig into the supply chain, the scalability and market landscape of the industry, and found the dynamics well suited to my interests and me. I also realized I had designed collections that were original and unique in many ways. RM – That first moment the Purely Portmanteau system worked. After rounds of prototyping over many months, when I got the pieces back from the workshop, fitted them together and they finally worked seamlessly in the way I had visualized it, the result was beautifully satisfying. OD – How are technology developments changing the fine jewelry lanscape? RM – Already we are seeing bespoke jewelry become more accessible and affordable than it once was. Machine production has also contributed to making pieces more affordable. I think we are now seeing more brands starting to consider transformative or multi-functional jewelry. But this is more about using established techniques for innovative design. On the horizon I see 3D printing as a game changer. Not as a replacement to traditional techniques as I believe real collectors will always admire the traditional craft, but rather this new production technology will lead to a new category. When the price of printing with fine metals drops further, I suspect it will offer the ability to produce affordable customized pieces with almost negligible lead times. Further down the road, I believe another new category will be the integration of digital technology in fine jewelry – wearable tech; fine jewelry that is functional and wearable. Again, I don’t see this as a replacement but rather an additional category. OD – How do your past experiences inform the technology-dirven approach in R.Y.M Jewelry? RM – I started university studies in Medicine but I ended up completing with Conflict Resolution. I then decided to take a job in advertising in NYC for a couple of years. I then worked at an advanced technology investment fund for five years before working on my jewelry line full-time. I’m still involved to a small extent in many of my former full-time pursuits and imagine I will stay engaged with these activities in some way in the future. Technologies are rapidly evolving. How do you keep track of what you’ld revolutionize your way of producing pieces? RM – Talking to people in the industry. Reading a lot, and most importantly, talking to people in industries very different from your own. The most unlikely new technologies and innovations are often transferable from unexpected places. OD – What makes R.Y.M Jewelry as spiritual and symbolic? RM – Creativity comes from my spirit and my own sense of spirituality. My designs have all been informed by how I engage with the world in the broadest sense: how I engage with places, systems, ideas, concepts, people that have been important to me. The pieces are also designed to allow the wearer to be creative – to commemorate meaningful moments, or to be reinterpreted to express a feeling or a style, to evolve over time. Being creative and dynamic is fundamentally spiritual. OD – How are you positioning yourself next to other independant fine jewelers? RM – I’m still figuring that out. I’m less interested in what others are doing and more interested in pursuing ideas and concepts that make sense to me. I believe in dynamic beauty and personalization. I believe in opening up the bespoke, personalized market to a wider audience. For more information, please visit her website here.